Dematic came to OST, looking for help creating an e-commerce platform for small-business owners to easily order products that were traditionally sold via a complex custom order process. When Dematic customers wanted to get a quote for a one-off set of products to extend an existing line or configure a new conveyor line they would have to call their sales person from Dematic. A meeting would need to be scheduled, the sales person would have to understand the customer’s needs and engineering time would have to be invested just to create a quote. OST worked with Dematic to create Dematic Direct. The goal was to take a largely enterprise facing company that sold highly engineered products direct to the enterprise, and open up a new business that allowed them to market directly to small businesses and consumers. Allowing customers to order standard product directly from an e-commerce site freed up resources to tackle custom orders. Dematic Direct was also created so new customizations and offers could be managed internally, without hiring a developer. As this was Dematic’s first entry into the public facing sales e-commerce application, we were able to guide them on some of the aspects that were new to them, such as SEO. 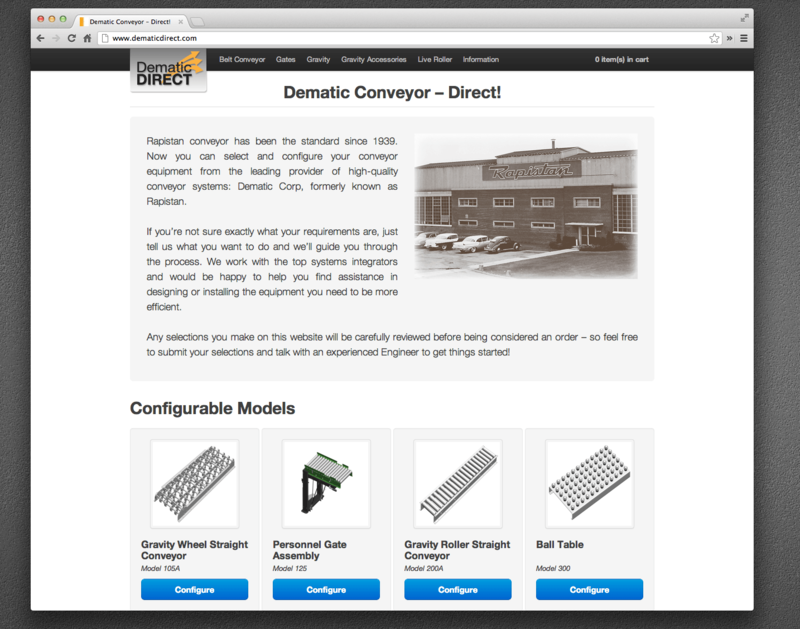 Now a key segment of Dematic customers can use this site to configure their own conveyor lines. They can do the what-if scenarios and get accurate estimates of the conveyor systems and parts they need. Once they are ready to proceed, they can trigger the ordering process right from the site. Dematic can reach more of their customers because the configurator is there when their customers need it. The solution OST delivered has led to increased customer satisfaction, more opportunities for Dematic, and better use of sales and engineering resources.